With expressive, bold shapes, and sculpted surfaces, the 2018 Malibu appears agile and dynamic yet refined. An integrated rear spoiler with aerodynamic benefits helps fuel efficiency. LED Daytime Running Lamps and taillamps and integrated chrome-trimmed dual exhaust outlets complete the front-end and rear-end appearance. The 2018 Malibu is generously equipped with comfort, convenience, and connectivity. Along with enough rear-leg room, the LT, Hybrid, and Premier trims offer 8-way power driver seat with power lumbar, heated and vented driver and passenger seats, heated steering wheel, and available remote start. Safety is number one and that is why the Malibu comes with Teen Driver technology as well! 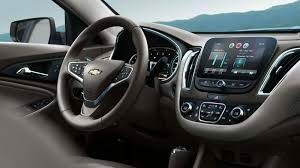 The Malibu features a 7″ diagonal color touch-screen providing control of the latest Chevrolet MyLink infotainment center. The Malibu is equipped with standard 1.5L turbocharged engine that offers an estimated 160hp and up to 184 lb-ft torque all while getting 27/36/30 mpg city/hey/combined. Also available with a 2.0L Turbo that offers an estimated 250hp and 260 lb-ft torque that receives 22 city/32 hwy mpg (thanks to an all-new 9-speed transmission, revised engine tuning, and the vehicle’s lighter weight). 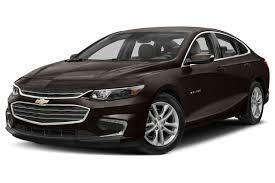 New Hybrid technology provides the Malibu with a 1.8L Hybrid engine that offers an estimated 124hp, 129 lb-ft torque, and an estimated mpg 49 city/ 43 hwy. Active Noise Cancellation helps provide an impressively quiet ride while electric grille shutters enhance efficiency at highway speeds.